The 16U team with players from throughout Burlington County is competing at the 18U level this season. The Moorestown Magic softball team poses for a team photo. The team placed second on Father’s Day at the Princeton Junction tournament. Approximately two years ago, three friends had the idea to start a team. Their daughters were beginning to age out of the local leagues, and so they decided to start their own with no clear idea how their team would fare. The Moorestown Magic proved themselves during their first season and emerged at the top of the powering rankings out of the 35 teams in New Jersey. Today, the 16U team is competing at an 18U level, and despite being a relatively new team compared to their other United States Specialty Sports Association competitors, the team is continuing to make a name for itself. 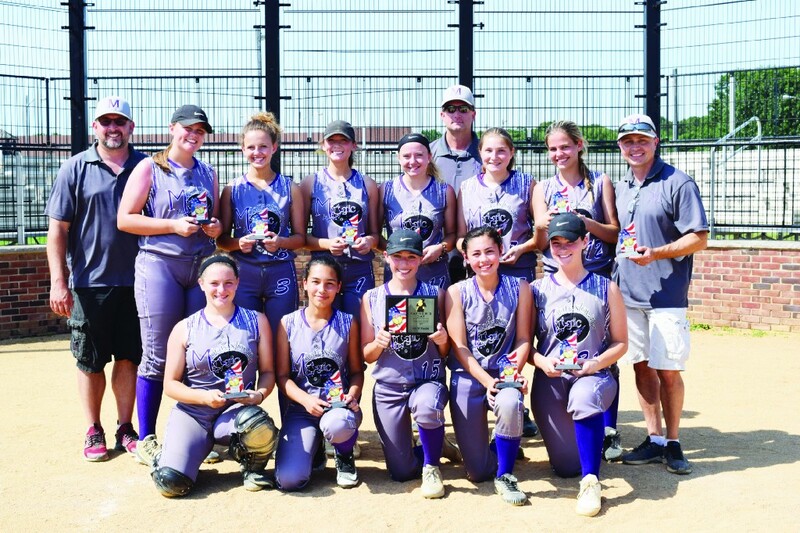 Head coach Steve Heffernen said forming a club team isn’t easy, so when he first got the idea, he recruited his friends Dan Macafee of Palmyra and Ron Casperite of Delran who had daughters around the same age. Heffernan said to assemble a team of high-caliber players they recruited from Moorestown, Palmyra, Cinnaminson, Delran, Burlington City and Edgewater. The Moorestown Youth Softball Association partnered with the team to provide insurance and field time. From the beginning, their expectations were minimal, Heffernen said. The team finished the season by winning the state championship in the bottom of the last inning. All of the players are involved in their local high school teams and have squared off against one another in the past. Macafee said the players’ ability to come together as a unified team despite past divisions is a testament to their character. “It shows how they are as people rather than just ball players,” Macafee said. The 11-player team from across Burlington County finished its season with a 15–2 record. While only one of the players qualified for the 18U division, they decided to move the entire team up, so they could continue to compete together. Despite being in the 18U division, none of the girls are 18 with the players ranging in age from 14 to 17. Heffernen’s daughter said the chemistry among players is what has made the team such a success. “We’re all just like one big family,” said 17-year-old Erika Heffernen who serves as team’s center fielder and pitcher. While the season doesn’t start until school lets out, the players continue their practices year-round. In the cooler months, they use the MAC gym at Moorestown High School for around an hour a week, and in the warmer months, they practice on Sundays. During the season, the team practices three days a week until the end of July. Macafee said all of the girls are seasoned players at this point, so it comes down to working on the finer details. He said since moving up to 18U, they have faced a much more competitive level of play than their first time around in the 16U division. Gearing up to face off against high school seniors and college freshmen can be intimidating, so in addition to putting in the hard work at practices, having the right mindset is also crucial, according to Jenna Casperite. “You have to have a good mindset and not go into the game thinking you’re going to get beat,” Jenna Casperite said. Heffernen said while winning is nice, his goal for each practice is a simple one. The team’s season is winding down. The team’s second go-around in the new division has been a bit more challenging, and they are currently at 10th in the power rankings. Heffernen said the beauty of being a young team in an older division is that they still have time to grow. He said while the other teams will lose players, they’ll be back together again next year and ready to compete.